a genus of nematode parasites. 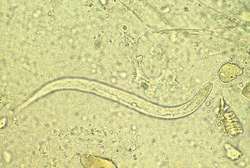 S. stercora´lis is a species found in the intestines of humans and other mammals in the tropics, and is the most common cause of strongyloidiasis. Life cycle of Strongyloides stercoralis. From Mahon and Manuselis, 2000. The threadworm, a genus of small nematode parasites (superfamily Rhabditoidea), commonly found in the small intestine of mammals (particularly ruminants), that are characterized by an unusual life cycle that involves one or several generations of free-living adult worms. Human infection is chiefly by S. stercoralis, the small human roundworm, widespread in all tropic regions, or by S. fuelleborni, a parasite of nonhuman primates in African and Asian tropics and of humans in African tropics. The subspecies S. fuelleborni kellyi occurs in New Guinea where it causes widespread infection. Fatal infection in 2-month-old infants, possibly infected by transmammary transmission, produces the condition known locally as swollen belly disease or swollen belly syndrome, which causes grossly distended abdomens, invariably fatal in these infants. Other species include S. papillosus in cattle, sheep, and goats, and S. ransomi in swine. /Stron·gy·loi·des/ (stron″jĭ-loi´dēz) a genus of widely distributed nematodes parasitic in the intestine of humans and other mammals. S. stercora´lis is found in the tropics and subtropics and causes strongyloidiasis. a genus of parasitic intestinal nematode. One species, S. stercoralis, causes strongyloidiasis, a potentially life-threatening infection under certain circumstances. The threadworm, a genus of small nematode parasites commonly found in the small intestine of mammals (particularly ruminants). Human infection is chiefly by S. stercoralis or S. fuelleborn. Fatal infection in infants produces the condition known as swollen belly disease or syndrome, which causes gross abdominal distention. a genus of nematode parasites in the family Strongyloididae, the larvae of which are able to penetrate the intact skin of the host then migrate to the intestine via the bloodstream, lung, trachea and pharynx. Many species are passed from the dam to the young via the milk. See also strongyloidosis. found in the ceca and small intestine of fowl, turkey and wild birds. found in the small intestine of the cat. found in the small intestine of primates. found in the small intestine of ruminants and rabbits. found in the small intestine of pigs. a species found in the intestine of humans and other mammals, primarily in the tropics and subtropics, usually causing diarrhea and intestinal ulceration. associated with tumors of the large intestine of cats. found in the small intestine of horse, pig and zebra. Strongyloides stercoralis hyperinfection could mimic accelerated idiopathic pulmonary fibrosis. Although there was no surveillance system, 1% of the samples were found to be infected with Strongyloides. Strongyloides stercoralis, an intestinal nematode parasite, is endemic/ubiquitous in tropical and subtropical countries. 10,9%; [ji al cuadrado] = 13,4; p < 0,01), al igual que con Strongyloides stercoralis (87,6% vs. The individual faecal eggs counts (FECs) were performed using a modified McMaster method  and the eggs per gram (EPG) were calculated for parasites of order Strongylida and Strongyloides spp. 1) Strongyloides stercoralis is an intestinal nematode that is endemic throughout the tropics and subtropics and has a life cycle consisting of free-living and parasitic components. 38 Microsporidia, 47 Blastocystis spp, 38 Entamoeba coli kisti, 18 Dientemoeba, 9 Chilomastix, 9 Strongyloides spp. 1997) and by an unidentified species of Strongyloides in a wild feline (Leopardus tigrinus) (SANTOS et al. 22%), followed by Trichostrongylus, Haemonchus, Ostertagia and Strongyloides (2. Infection with helminths, especially Strongyloides Stercoralis (SS) is a poorly studied and reported condition. Stool testing for ova and parasites showed Strongyloides stercoralis larvae. Non-opportunistic parasites such as Trichuris trichiura, Ascaris lumbricoides, Strongyloides stercoralis and Ancylostoma duodenale are frequently encountered in developing countries, but not currently considered opportunistic in AIDS patients.